the 1860 US census for Johanna and her husband, Thomas, in Chicago with three other siblings – Mary Gray, James Brown and Thomas Brown. 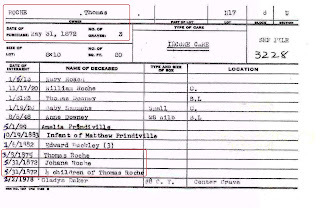 Like most surnames, records associated with this family are shown with multiple spellings, most often Roche or Roach. While the preferred Irish spelling is the Norman version Roche, meaning “rock,” records in both Ireland and American refer to the same family using a number of different spellings. To make it easier for future researchers to locate the same record cited in this blog, I will give the spelling of the name as it appears in the specific record. As I was doing my research, I found a group of descendants of Johanna who are also researching Johanna’s life – or rather they found me! They have been doing research for years and have uncovered many wonderful stories about Johanna and her family. So, while this blog is about Johanna and Thomas, it is also about Johanna’s descendants who cherish her memory. in the David Brown letter, and a one year old daughter, Emma, who was born in Wisconsin. Obviously, Johanna lived in Wisconsin between living in Vermont and Chicago, but just where in Wisconsin? Immigrant families often stayed together when they arrived in America. 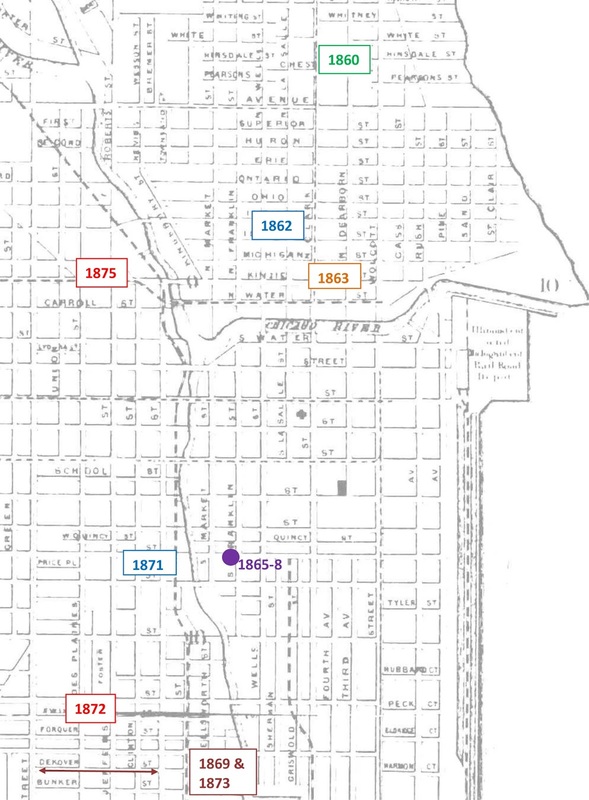 To see if there were any clues, we look back to other known relations in Chicago, specifically, the family of John and Ellen Kelly Brown, brother and sister of our own Timothy and Hannah Kelly Brown, who were living at the same address as Hannah Brown and her family in Chicago in 1870. (See blog post on Chicago.) A list of burials in Calvary Cemetery was shown in that blog post. Included in the cemetery list was Ellen Brown, the widow of John Brown4, Mary O’Brien, a daughter of John and Ellen Brown (baptized June 15, 1828 in Patrickswell), and Nellie Ryan, a daughter of Mary Brown and her husband, Michael O’Brien. 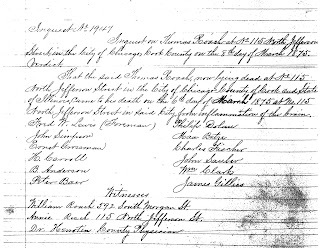 The death record for Nellie O’Brien Ryan shows her date of birth as April 13, 1859 and place of birth as Janesville, Rock County, Wisconsin5. Could this be the connection we needed to place Johanna Brown Roach in Wisconsin? marriage record for Johanna Brown and Thomas Roche on December 22, 1857. During this time frame, the birth of a first child usually took place about a year after the marriage of a couple. Was Emma the first child, or was there an additional child, or perhaps a miscarriage, before Emma? No additional baptisms were identified at St. Patrick’s for children of Johanna and Thomas. Since baptisms usually occur shortly after the birth of a child, the assumption is that Emma was conceived sometime around March 1859. However, the 1860 US census, taken in June 1860, shows Emma as one year old making her birth approximately June 1858 to June 1859. The records for St. Patrick’s also show a baptismal record for Nellie O’Brien, daughter of Mary Brown and Michael O’Brien on December 19, 1859, just a day before Emma’s baptism6. We know from Nellie’s death record that she was born in April 1859, some eight months before she was baptized. Could the same thing have happened with Emma? to serve the Irish population7. 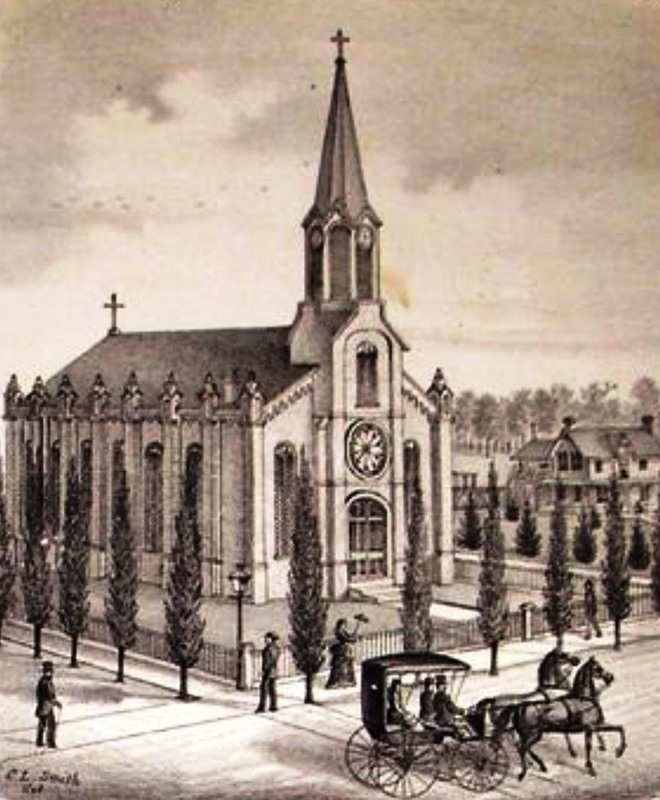 Services in the early years were held by traveling clergy in the homes of parishioners. Even after a permanent building was erected, there was not always a resident priest. The baptisms of Emma and Nellie could have been delayed until a priest was in the vicinity. Based on that information, Emma was probably born some months before her baptism. There may have been another child born to Johanna and Thomas while they were living in Wisconsin but it cannot be definitively determined. It appears that at least part of the family lived for awhile in Rock County, Wisconsin. What was the attraction to this area? Rock County is located in the southeastern portion of Wisconsin and shares a border with Illinois being close to Milwaukee, but more importantly within a short train ride of Chicago. Transportation to the area was plentiful with connections in Janesville to three freight and passenger railroad lines. A history of Rock County Wisconsin8 states, “The principal attractions of Wisconsin were the excellency and cheapness of its lands, its valuable mines of lead, its extensive forests of pine, and the unlimited water-power of its numerous streams [used for flour and lumber mills]”. Railroads were also being constructed during the 1850s providing additional employment opportunities. Other reports stated that the landscape looked like Ireland with a similar climate affording even more incentive to stay in the area9. Furthermore, the Wisconsin Commission of Emigration actively encouraged European immigrants to settle in Wisconsin during the early 1850s. Pamphlets were distributed to many parts of Europe including Ireland, and eastern port cities such as Boston, New York, Montreal and Quebec. Advertisements were placed in numerous newspapers extolling the virtues of the area10. The Irish would have been well acquainted with the advantages to be found in Wisconsin. 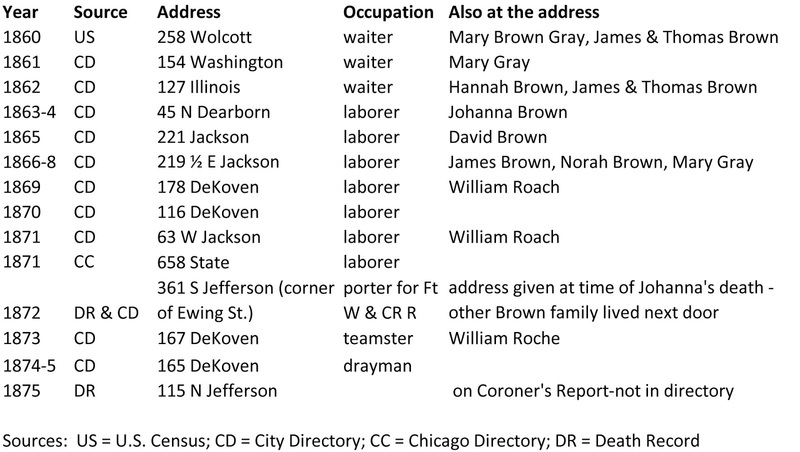 contributing factor in her death; but, many Chicago residents died months, and even years after the fire as a result of smoke inhalation and injuries received at the time of the fire. 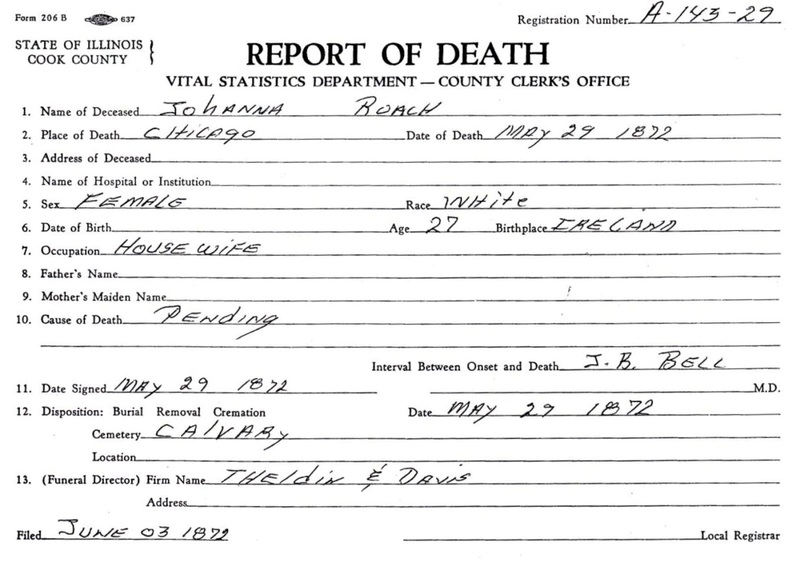 The Vital Statistics Department in Chicago shows her cause of death as “Pending.” (See image left.) Memories of the family give her cause of death as typhoid and/or childbirth. of deaths by age group. 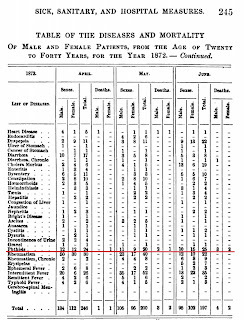 The table for persons aged twenty to forty for May 1872, the month Johanna died, identifies one female who died of heart disease and one female who died of phthisis (tuberculosis). Since Johanna died at the end of May, her death could have been reported in June when two females died of phthisis12. The David Brown letter states that, “. . . Johanna Brown was sick at the time [of the fire]” which could indicate one the conditions identified above – childbirth, typhoid, or tuberculosis. If she was ill with any of those conditions, the fire would certainly have been detrimental to her health. Chicago. The lot was purchased by Thomas on the same day Johanna was buried13. A record of the burial is shown left. 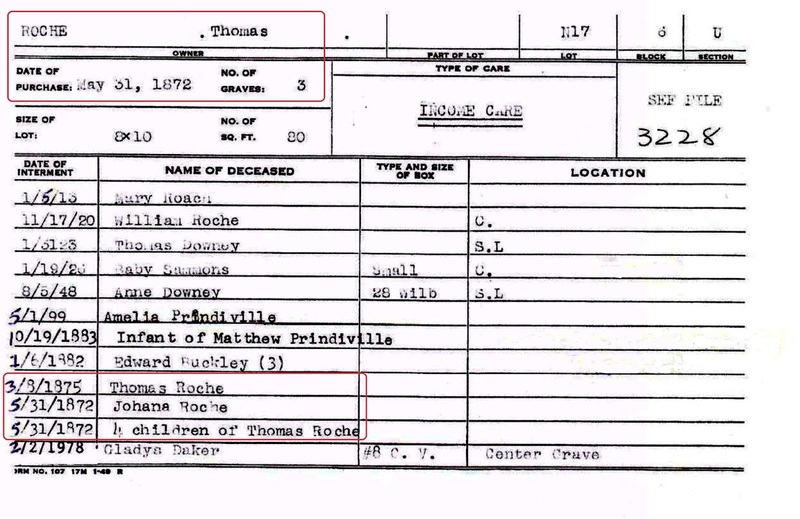 Note that four children of Thomas Roche were also buried the same day in the same lot. Johanna and Thomas did have additional children. 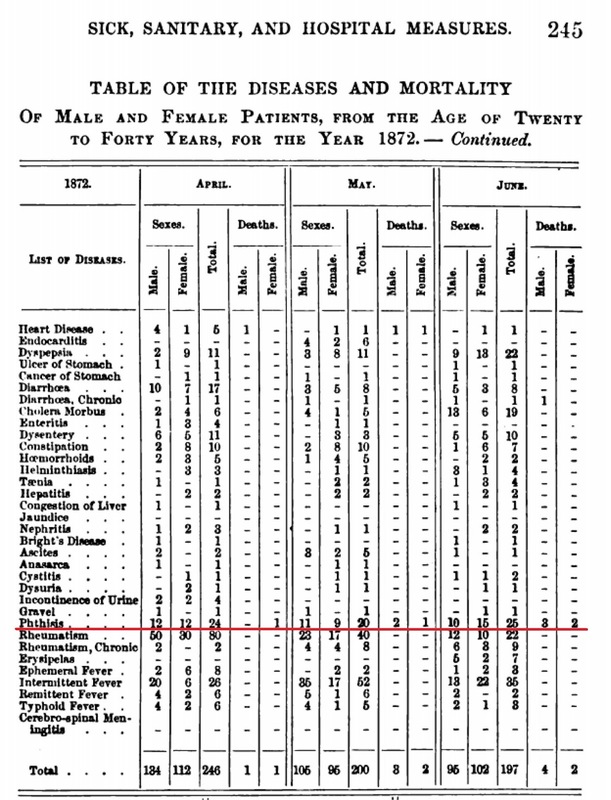 The 1870 US census14 for Thomas and Johanna Roach shows two sons, James (1863) and David (1865), who survived to adulthood. Emma is clearly missing from the 1870 census; and, in fact, is not listed with the family in the 1865 Illinois State census15. Emma likely died between 1860 and 1865 and could be counted as one of the children; but, was she actually re-interred in1872 when her mother died? If Johanna was pregnant at the time of her death, and the child did not survive, that could also account for one of the four children. Who were the other children and did they all die at the same time? Using the census records as a guide, the children would have been born and died between 1860 and 1865, and/or 1865 to 1870. Despite extensive searches, the names of the other children have not been identified16. George Roach, the younger son, remembers children being moved from another cemetery and reburied with their mother when Johanna died. This was clearly a traumatic event for a small boy of six or seven years old and would have been ingrained in his memory. determined that the cemetery posed a health threat to the people living in the vicinity and, indeed, to the rest of the city. The land, located below the water table, was not well suited for a cemetery. There was a “miasma” rising from the cemetery and it was feared the city’s water supply would be contaminated from bacteria leaking from the graves into the lake which was the source of Chicago’s drinking water. The city proposed closing the cemetery and moving the burials to other locations – at the cost of the individual. Although burials continued officially until 1866, some graves were removed starting in 1859. The City Cemetery was the only cemetery in Chicago where mass disinternments took place18. This is the probable place of the original burial of the Roach children – likely in the Potter’s Field. The question remains about who moved the children and who covered the cost of the removal and reburial? The Roach family, as were most Irish families in Chicago at the time, were poor and the cost of having someone else move the children may have been more than they could manage financially. Did the family disinter and rebury the children themselves? 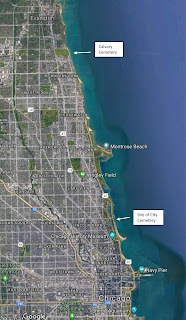 Also, since most markers in the cemetery were destroyed when the Great Chicago Fire raged through the cemetery in October 1871, could the graves have even been located? There is another alternative. An article in the Chicago Tribune, from September 18, 1872, some three months after Johanna’s death, states that there were over 10,000 persons still buried in the Potter’s Field. The city wanted to clear the area. As a result, “ . . . the city, . . . , very generously agrees to allow the former owner a lot, equal in size to the one vacated, in any cemetery the owner may specify; and, in addition, proposed to liquidate all expenses incurred in exhuming and transporting the remains to their new resting places.” Even though this was published after Johanna’s death, was the same, or similar, offer made earlier to the Roach family19? The next blog post will present additional information about Johanna’s husband, Thomas. Information contained in this blog post was provided by the descendants of Johanna and Thomas. Special thanks to KC, Eileen, Leslie, Greg, Kerry, and many others. 2. Brown, David, Kewanee, IL., 11 May 1943. Letter to Esther _______, Columbus, OH, page 6. 3. "United States Census, 1860", database with images, FamilySearch (https://familysearch.org/ark:/61903/1:1:MX4B-BJS : 13 December 2017), Johannah Roach in entry for Thos Roach, 1860. 4. 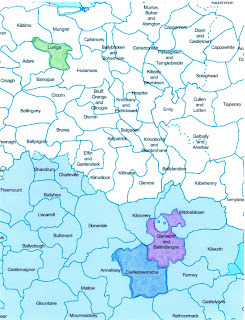 John Brown was listed in Griffith’s Valuation published for the Fanningstown area in 1851. He probably died between 1851 and 1856 when his holding was taken over by another tenant. 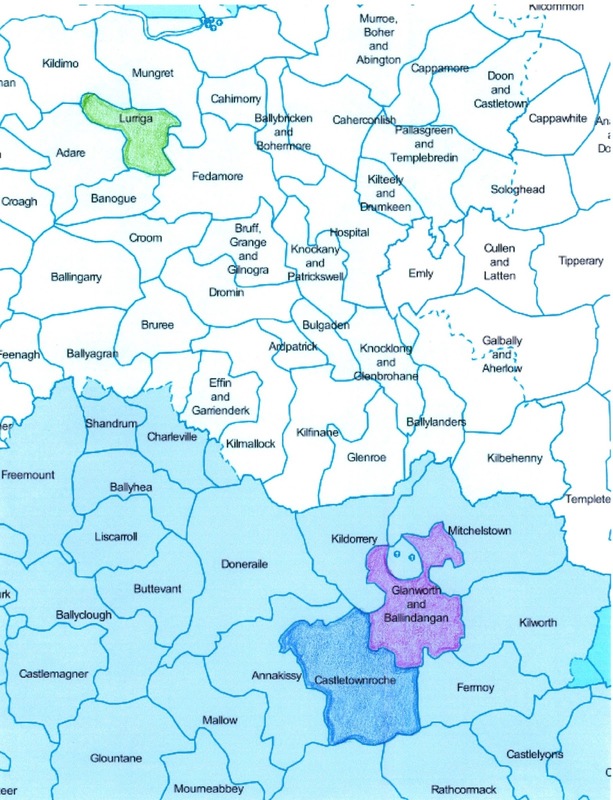 (See previous blog for Putting them on the Fanningstown Map.) No record of arrival in America of John’s family has been found. 5. 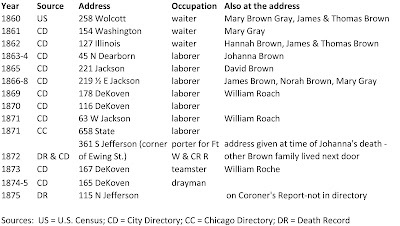 "Illinois, Cook County Deaths, 1878-1994," database, FamilySearch (https://familysearch.org/ark:/61903/1:1:Q2MD-TNCR : 17 May 2016), Nellie A Ryan, 21 Jul 1942; citing Chicago, Cook, Illinois, United States, source reference , record number , Cook County Courthouse, Chicago; FHL microfilm . 6. Records from St. Patrick’s Catholic Church, Janesville, Rock County, Wisconsin. Emma Roche, baptized 20 Dec 1859, parents are Thomas Roche and Johanna Brown; sponsors are Julienne Curtis and Hanna Brown; record is too fragile to copy. Marriage record for Thomas Roche and Johanna Brown on 22 Dec 1857; witnesses are Jacob Flannigan (Hannigan/Harrigan) and Edward McGurk. They were the last couple married in the church in 1857. Elleanor O’Brien, baptized 19 Dec 1859, parents are Michael O’Brien and Mary Brown; sponsors are Jacob Brown and Marie Relly (could be Kelly). The above information was obtained from Lori, an employee of St. Patrick’s Catholic Church in November 2017. 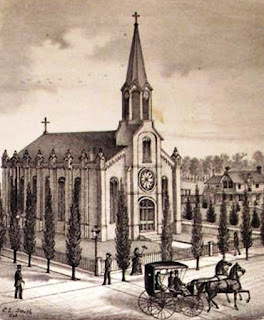 Lori did say there was a visiting priest in mid-December 1859 and many baptisms were performed at that time. 7. Uncaphon, Wendy, Guide to Rock County Wisconsin Churches, Cemeteries, Schools and Towns, Rock County Genealogical Society Inc, Janesville, Wisconsin, 2008. Accessed October 2017 at the Allen County Public Library, Ft. Wayne, Indiana. 13. Copy of Burial Card from Calvary Cemetery in possession of the descendants of Thomas and Johanna Roche/Roach. 15. Illinois State Archives; Springfield, Illinois; Illinois State Census, 1865; Archive Collection Number: 103.010; Roll Number: 2172; Line: 35. The census shows two males under ten years of age, and one male and one female aged twenty to thirty. 16. 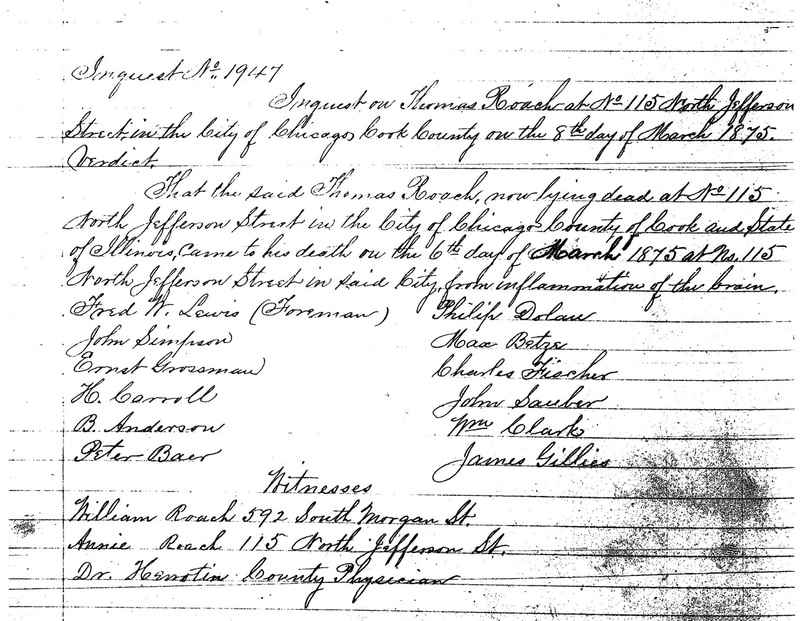 Research done as crowd sourcing with descendents searching various Chicago records including Catholic baptisms in Chicago for 1860 to 1872, and cemetery records. 17. 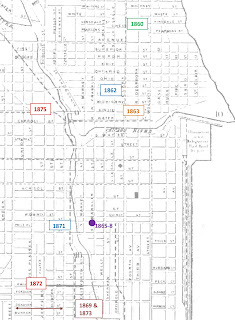 Current map of Chicago showing the location of the Lincoln Park area and Calvary Cemetery in Evanston. Map from Google Maps. 18. Bannos, Pamela, Hidden Truths: The Chicago City Cemetery & Lincoln Park. http://hiddentruths.northwestern.edu/home.html Ms Bannon has done extensive research about the old Chicago City Cemetery where Lincoln Park is now located. She has scoured old newspapers, and state archives for information about the cemetery from its beginning through to current times. Many images are included in the website.